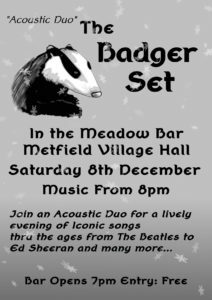 Badger Set are back playing an eclectic, acoustic mix of your favourite music from The Monkees to The Jam and beyond. Don’t miss it. The Badgers deliver a lively evening of musical enjoyment with huge singalong opportunity.